Heavy rains for last 2 days have created a flood like situation in Srinagar city. Jhelum river has crossed its danger mark and if the water rose another 2 to 3 feet, it will flood the entire Laal Chowk. Authorities have issued a flood alert in Srinagar, sSchools have been shut down and Amarnath Yatra has been suspended for now. Srinagar Leh highway remained closed all day yesterday and was only reopened in the evening for a little while. There was a landslide at Jammu – Srinagar highway yesterday leaving thousands of people stranded on the road. It would be unsafe to travel towards Srinagar as of now; until situation is back under control and weather clears. The Jhelum river too flowed above the critical 21 feet mark at Sangam in south Kashmir’s Anantnag district due to heavy rains over the past two days. The water level in Jhelum at Ram Munshi Bagh in the city was 13.34 feet at 6 pm; over 4.5 feet below the flood declaration level. He said the people living in areas along the embankments of River Jhelum; other streams and in low lying areas were advised to remain vigilant. Besides this, a landslide blocked Jammu-Srinagar national highway late on Friday afternoon; leaving hundreds of vehicles including those carrying Amarnath pilgrims to the base camps in the Valley stranded. Heavy rains triggered the landslide at Gangroo near Ramsu along the 260-kilometre long highway; the only all-weather road connecting Kashmir with rest of the country. Heavy rains in Banihal-Udhampur sector had also triggered landslides; and shooting of stones at four places at Panthal, Nedgard, Digdol and Samroli this morning; blocking the highway, the officials said. However, they said the agencies concerned pressed men and machines into service; and after hectic efforts cleared the blockade in the shortest possible time at around 0915 hours. Massive traffic jam was reported at several places along the highway throughout the day; causing hardships for the traffic personnel; and police to manage the traffic despite the rain, they said. Earlier in the day, the Amarnath yatra to the cave shrine in south Kashmir was also suspended from the Baltal route; due to multiple landslides en route caused by heavy rainfall in the Valley over the past two days. 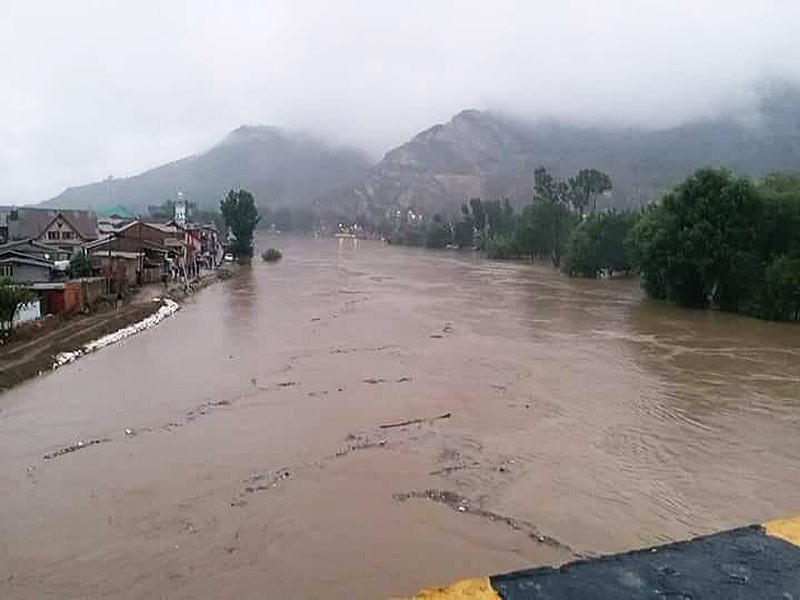 An official of the MET office said south Kashmir’s Kokernag; in Anantnag district, received the highest rainfall of 63.4 mm till 8:30 am this morning; while the neighboring Qazigund received 58.6 mm of rainfall. Should i cancel my tommarow ticket for leh ladakh trip..!! If you are flying directly to Srinagar then yes I would recommend that. Is any inprovement now.. ?? Not really. There is a forecast of heavy rains again tomorrow. thank you for your valuable information..